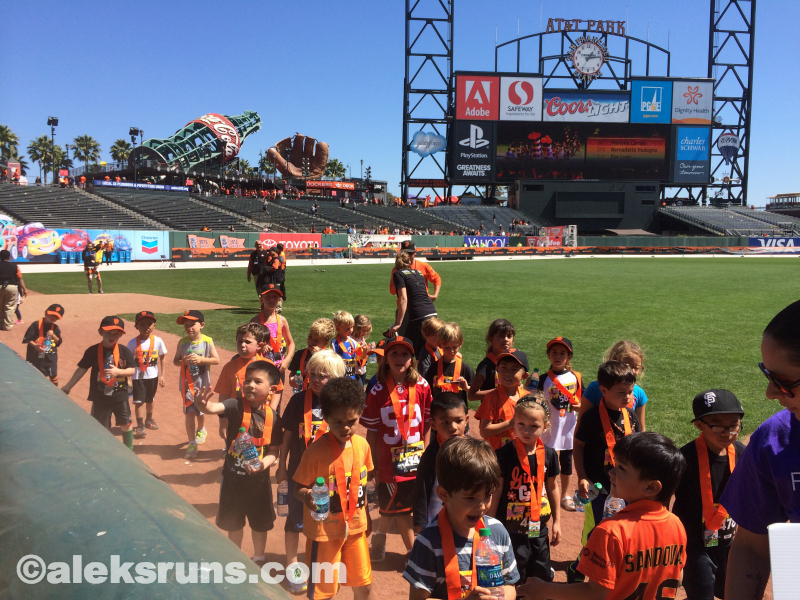 This weekend was the fifth running of the San Francisco Giants Race. And I’ll tell you what: this one seems to be getting more giant each year! 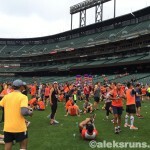 There were nearly 16,000 finishers in the three distances combined (5K, 10K and half marathon) – check the results if you don’t believe me. 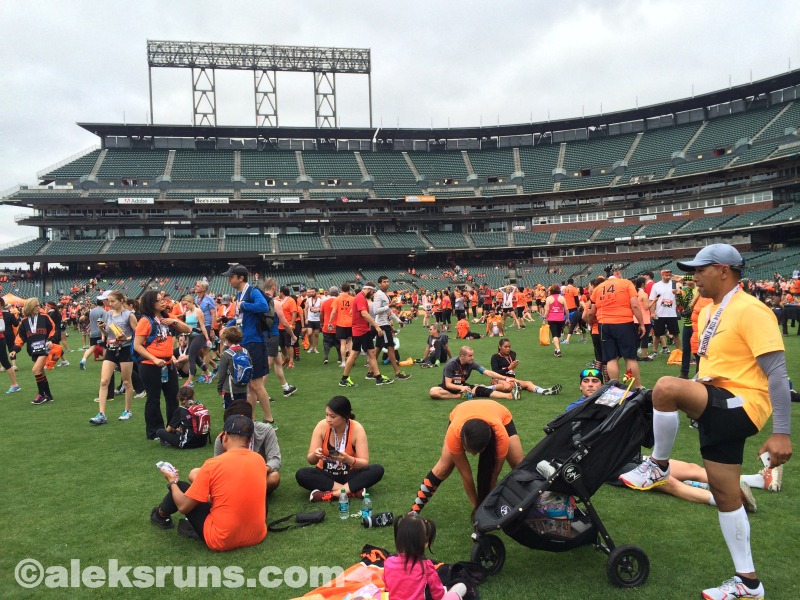 My half marathon age group alone (F35-39) had 426 finishers. Back in 2010? Only 102. 1. The porta-potty lines were GIANT, as usual. But I had great company, it was fun! 2. 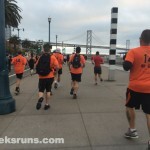 Headed – running! – to the start 10 minutes late. Coach D told me to warm up, so there you go. 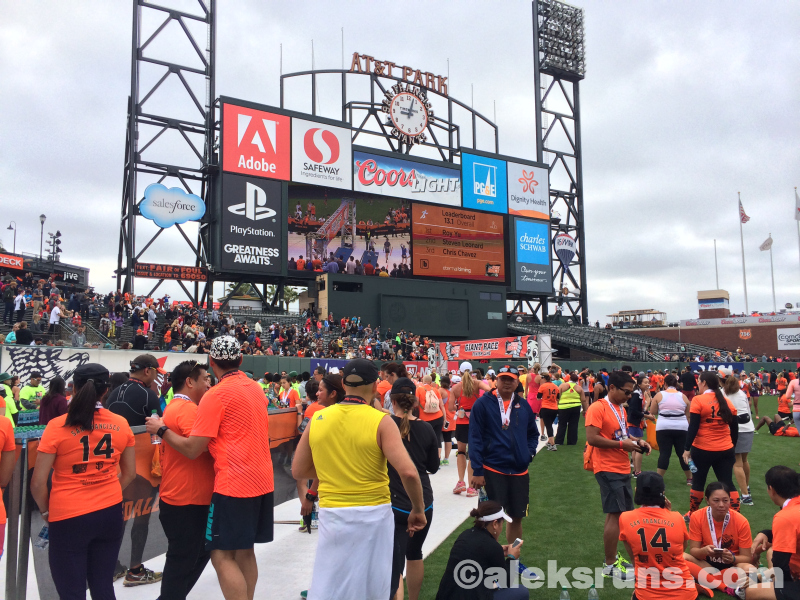 By the time I made it to the corner of 3rd Street and Townsend, my wave – #2 – was long gone. 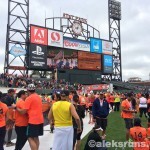 So rather than slowly advancing towards the Start line with the current wave – #4 – I decided to try and squeeze through the crowd as quickly as possible. More “Excuse me, coming through” than I could count, I crossed the start, about 11 minutes after the gun. 3. Started right behind the 2:45 pace group. So much zigzagging. And running on the sidewalk. Heck, even the sidewalk was crowded! 4. Passed people. Passed more people. At the 10K turnaround point, the crowd thinned out somewhat, though by then, the half marathon leaders had started coming back so dodging runners became slightly dangerous. But I felt fresh and surprisingly strong. And completely oblivious to my still nagging road rash and knee/ hip kinks (result of a bike crash a week ago). Adrenalin! Helps! Pace for Miles 1-3: 8:02, 8:06, 8:13. There are three short climbs, all in Mile 4 of the half. I always underestimate them. But still feeling pretty good, legs light and breathing back to normal quickly after each climb. Pace for Miles 4-6: 8:33 (climbing! ), 8:12, 8:19. 6. Some guys just don’t like to be passed by a girl. I was still passing people and occasionally getting passed by someone who had clearly been late and missed their wave start as well. This one guy in a blue shirt, though – I noticed this because everyone else was wearing orange – decided he shall not be passed by a girl in a blue skirt and sped up ahead of me. I kept my pace and shortly after ran by him as he had slowed down. He sped up. And again. He gave up right before the turnaround (near Golden Gate Bridge, very pretty). Pace for Miles 7-9: 8:18, 8:11, 8:24. Mile 9 is always one of my slowest in this race. Must be the change in terrain, as we run on the dirt/ sandy road by the ocean for almost the entire mile. Then we head over to the final climb, followed by a steep downhill where everyone sprints, trying to make up for time lost on the hill. Mile 10: 8:38. 8. 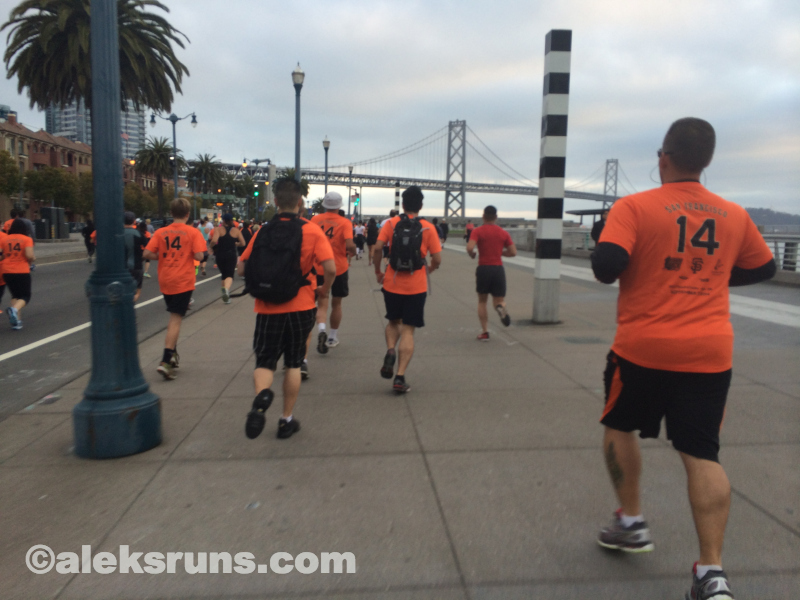 Final stretch on the Embarcadero. Scenic! I was feeling some fatigue by then, but I made myself pick up the pace again. To my surprise, it wasn’t that hard. 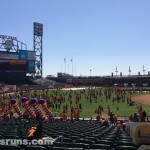 Maybe because by then, the crowd had thinned out considerably and I could run like a normal person. Miles 11-13: 8:16, 8:13, 8:12. 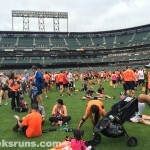 Right before entering AT&T Park, I passed the 2:00-hour pace group. The pace leaders shouted encouraging words as I looked at my Garmin, realized I could PR by several seconds at least, and booked it. Pace for that last stretch: 6:53 (for 0.3 miles, according to my watch – you know how GPS watches always measure races longer than the official distance — and surely the zigzagging must’ve something to do with that, as well). Net time: 1:49:19, a 16-second PR! Ah, kidding of course. This is where the best part begins! 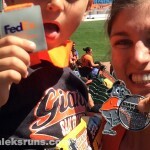 Grab your medal, walk around, stretch, just hang out at the field. When else do you get a chance to do something like this? 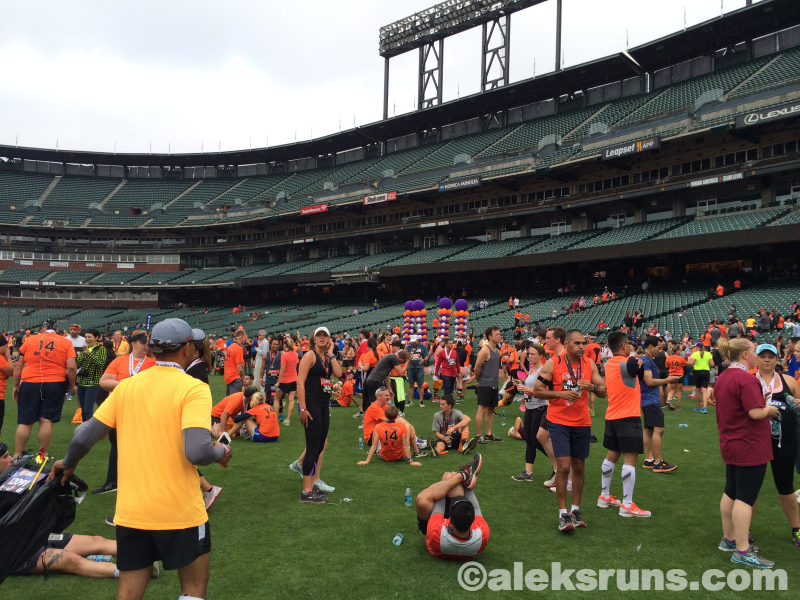 Only happens once a year, at the Giant Race! 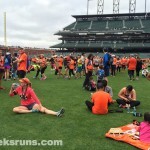 We lucked out with the weather this year – perfectly overcast while we ran and slightly chilly (windy) at the finish, but nothing a change of clothes wouldn’t fix! After a quick Starbucks run (best! 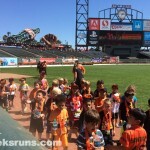 ), I came back to the Park shortly after 10 a.m. to pick up KidRuns’ bib and get him ready for the Kids Race. 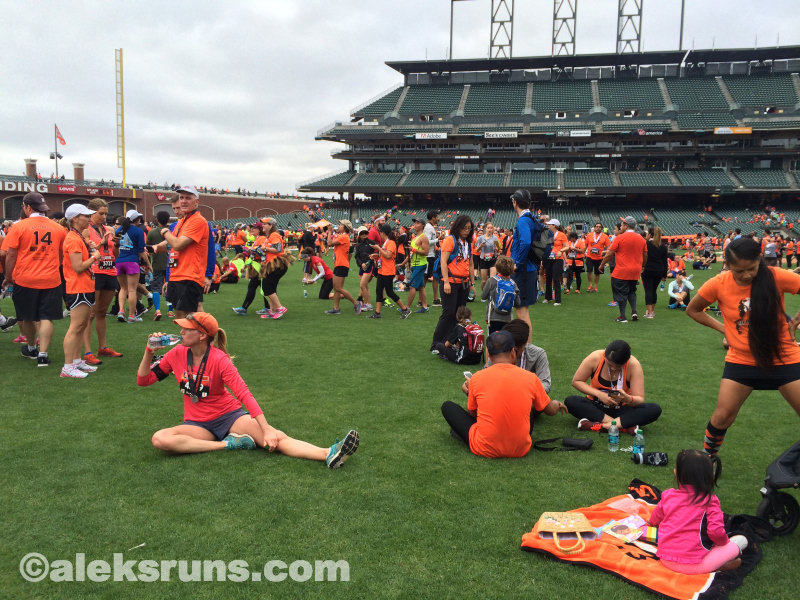 That wouldn’t start until all 5K runners were done and off the grass – and with almost 6,500 5K finishers, that took quite a while. So we sat in the bleachers, enjoying the sun – then the shade, as the sun got a wee bit too strong for my taste and we moved. Was fun as always. Well organized, kids go out on the field in relatively small waves and run one, two or three laps around while parents wait in the bleachers. Here’s KidRuns’ wave coming back from their lap of glory: Unlike last year, when he was tired and absolutely refused to run, this year he reported his race was “the best”! We stayed to watch the very final wave of kids and family relay participants, finally heading home well after 2 p.m. 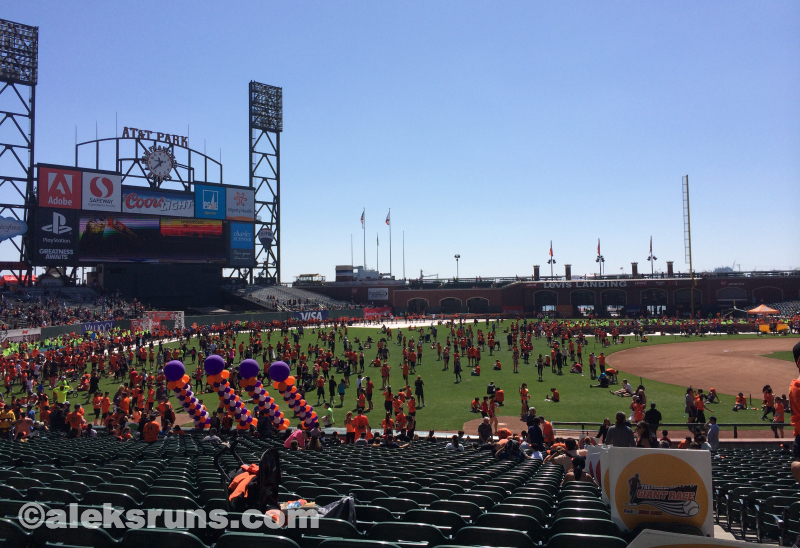 Yet another fun – GIANT Fun! – day at the races! Congrats on a PR! That’s awesome, especially starting with the 2:45 pace group and all the associated bobbing and weaving that goes along with a crowded course like that. Nice work Aleks. Your training pays off. Looks like a fun time.